Do you have the in-laws coming over for dinner? Friends coming for a dinner party to see your new place? Whatever the dinner party occasion, this is the perfect dish for it. Lamb shanks always look impressive and the beauty of this dish is that you only have to do around 20 minutes prep work and then the oven does all of the work so that when your guests arrive all you need to do is dish it up. This is ideal dinner party food as it allows you to spend more time hosting your guests instead of sweating away in the kitchen. This really is the ultimate one-pot dish. You don’t need to do any sides the stew created by the beans and the vegetables is really hearty and definitely filling enough. Equally if you don’t have regular dinner parties or, like me, live in a flat too small to accomadate extra people, this also makes a really great hearty alternative to a Sunday lunch. 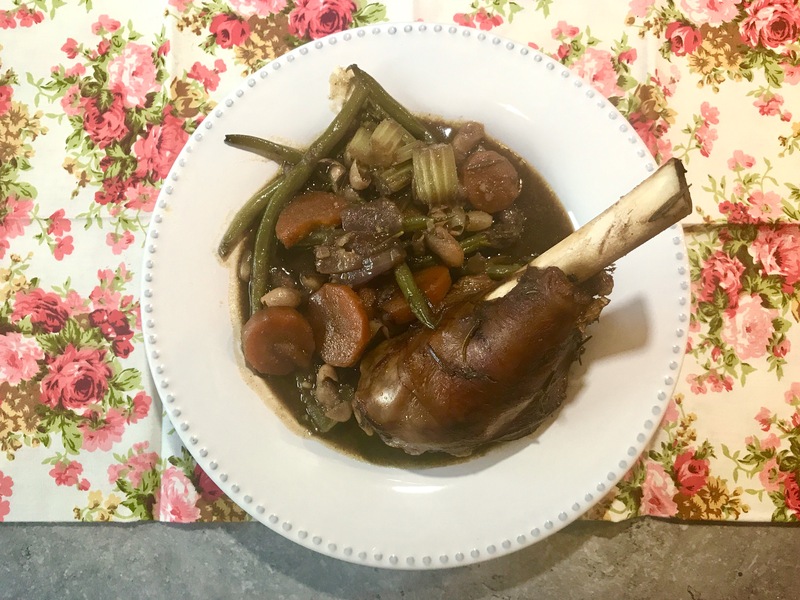 It may seem a bit extravagant to get yourself lamb shanks for dinner, but if you buy them when they’re on offer and pop them in the freezer it really doesn’t have to be an inaccessible option. Whenever I do my weekly shop I like to check the reduced shelf and the special offers for good deals, it doesn’t matter if you’ve already planned out that weeks meals, that’s what your freezer is for. Next week when it comes to meal planning have a look at what you’ve got stashed away in there, I find that some weeks I’ve got enough things to use up from the freezer that the week’s shop is really just a top up for fresh fruit and veg to go with it. 2. Heat the oil and butter over a medium heat in a large casserole dish. 3. Add the rosemary and the lamb shanks and brown the lamb shanks, sealing the meat on all sides. 4. Throw in the allspice, and season generously with salt and pepper. Keep the meat turning until all sides are coated and the meat is nicely browned and golden. 5. Remove the shanks from the dish and set aside. 6. Add the onion, celery, garlic cloves and carrot to the pan and throw in the red wine, this will help lift all of the yummy meat flavours from the bottom of the pan and help them coat the vegetables. 7. When the vegetables have begun to soften add the green beans and continue to cook for a further 5 minutes or so. 8. Pour the tin of beans (including the water) into the pan, add the stock pot and pour in the additional water. 9. Bring to the boil and then simmer for five minutes. 10. Return the lamb shanks to the pot, nestling them into the vegetable mixture so that they’re mostly covered. 11. Put the lid on the casserole dish and roast in the oven for 1 hr 45 minutes. 12. Remove the lid, return to the oven and cook uncovered for a further 30 minutes.